With the announcement from Ancestry.com regarding the end of their Family Tree Maker Software Package, users need to consider other options. For FTM users, Ancestral Quest wants you to know that you have a home here with AQ and we will take good care of you in respect to importing your files and providing great customer service. AQ has received high ranking awards from GenSoftReviews and its users. AQ is available for both PCs and Macs. We have a special page set up to welcome FTM users here and are offering a special discount of $10 for a limited time to those who wish to move from FTM to AQ with a special discount code. We are here to help you with the transition. Ancestral Quest works well with the Heritage Collector Suite as it allows you to organize, find, share and preserve all your family history photos, files and documents and create multiple items to share with family. You are also able to run Heritage Collector on an Eternal Hard drive. This becomes handy when taking family trips or visiting family and friends. Drag and Drop photos to and from FamilySearch, Facebook and Pintrest into Heritage Collector Collections. Included are Free Webinars to help anyone at any level of expertise. Learn at your own pace when its convenient for you. Special Introductory price includes $20 off through Ancestral Quest for $79.95. This would make a great gift for Christmas along with Ancestral Quest! To download any of these you simply follow the instructions provided with each one. 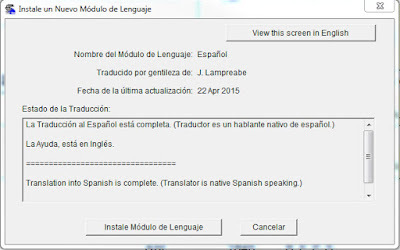 All of these language modules are available here. 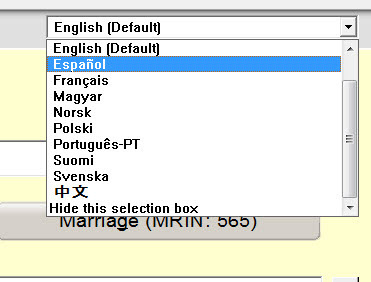 To change it to "Spanish", which I don't have at this time, I would click the drop down menu at the top right and select the language I wish to install. For this blog I will install Spanish. For those who need a different language it is that simple.